The perfect treat for chocolate lovers of all ages. Packages include Cadbury World day ticket plus your choice of 2-4 star hotel near Cadbury World, Birmingham. 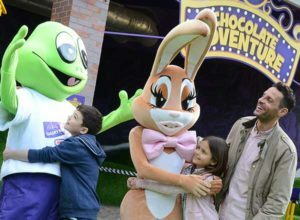 Cadbury World is located in Bournville, Birmingham and is easily accessible from the M5 or the M42. 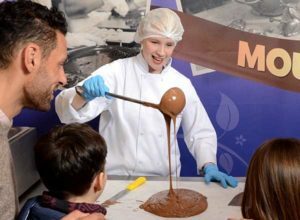 With so much to see and do at Cadbury World these value for money short breaks are perfect as they provide an opportunity to experience British chocolate heritage and include your entry tickets plus an overnight stay at your choice of hotel. Hotels range from 2-4 stars and are located either close to or within an easy drive of Cadbury World, with many offering excellent children’s rates, plus great facilities. Cadbury World offers an exciting fun packed day out for chocolate lovers of all ages with 14 zones of chocolatey fun and delights to explore. Learn all about Cadbury’s fascinating history and heritage. Then climb aboard your Beanmobile for the gentle Cadabra ride through a chocolate wonderland full of familiar characters as you discover the magic of Cadbury. Have fun playing in chocolate rain, writing your name with liquid chocolate and concocting your own creation. Join Freddo and a whole host of Cadbury characters as they whisk you off on an immersive adventure in the brand new 4D cinema experience complete with motion seats. Visit to the world’s biggest Cadbury shop to stock up on all your favourite Cadbury treats. This Cadbury World package deal includes an overnight stay at your choice of hotel and additional nights can be added to your booking if you wish to create a longer break. Once you have selected the date of your Cadbury World visit you will be able to choose your accommodation from the list of hotels that have availability for your travel dates, many offering excellent children’s rates. Lead in price of £39.50 per person was for a visit to Cadbury World on 17 November 2019 staying for 1 night at the Holiday Inn Express based on 2 adults sharing. Prices shown are for guidance only and were available at the last update. Actual price will vary depending on travel dates, time of booking, hotel and duration of your break.